Visiting a flower shop in the dead of winter is a bit like crashing a slumber party full of preteen girls when they first discover makeup. If a little color is a good thing, surely every shade on the color wheel must be better. 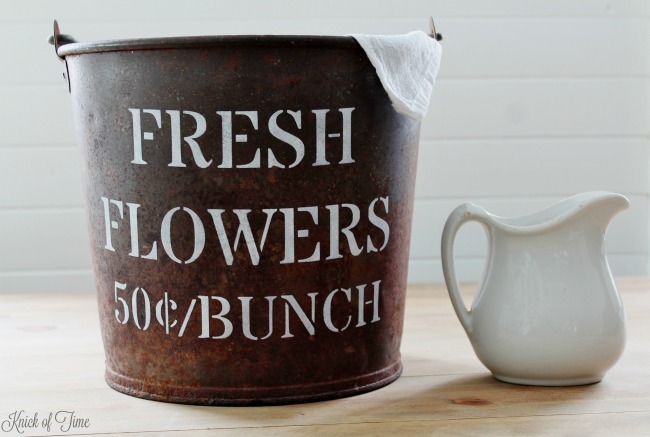 flowers to brighten up a dreary winter day, but it was also the perfect time to give an old rusty metal bucket the makeover it needed. 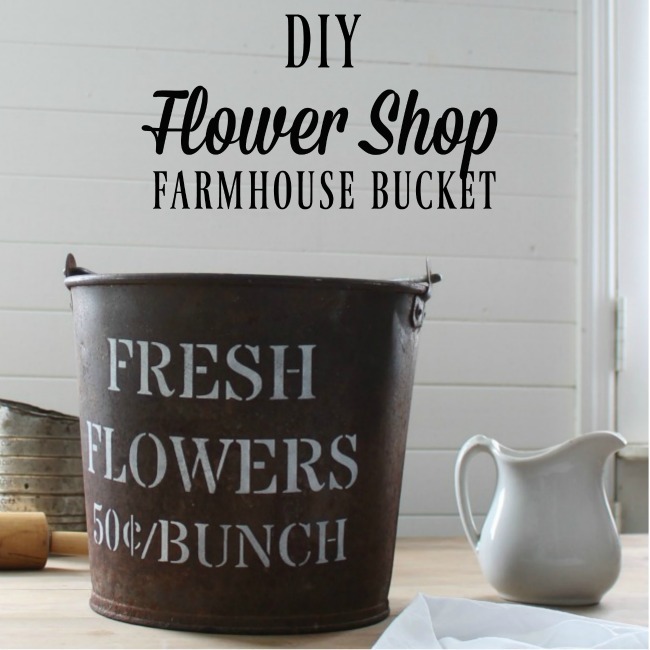 Believe me, giving the bucket a makeover was so much easier than actually finding any beautiful flowers in the flower shop. Other than a few bouquets of roses, I couldn’t find any naturally colored flowers. There were bunches and bunches of flowers with fake color. There were bright blue carnations, and bright pink daisies, and fake berries coated in glitter were tucked into each bunch of flowers. It looked like the whole slumber party of teenage girls showed up and went crazy with all their makeup on the poor flowers. I walked out empty-handed and feeling nauseous from the fake color explosion, but I still wanted to give my rusty old bucket a makeover. I know eventually summer will come and I’ll be able to get plenty of flowers then. Perhaps before any young girl is allowed to wear makeup, she should first learn to stencil. Because the first thing you learn about stenciling is the less paint you have on your brush, the better the finished look will be. If you try to put on too much makeup …. paint, you’ll end up making your project (or face) look awful. And sometimes just a little color is all you need to highlight natural beauty. 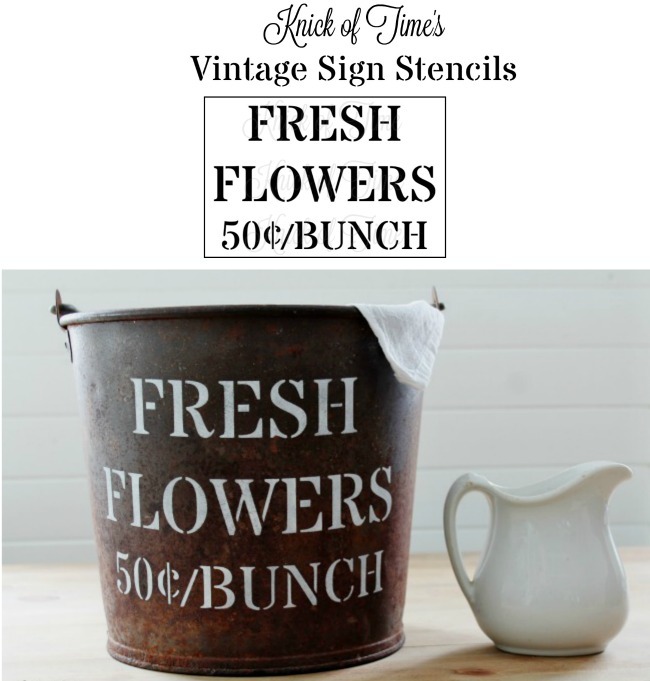 Even though this old bucket has grease marks and lots of rust, stenciling the fresh flowers sign on it distracts the eye from those imperfections, and makes it look like it it could be used to hold flowers for a flower shop. 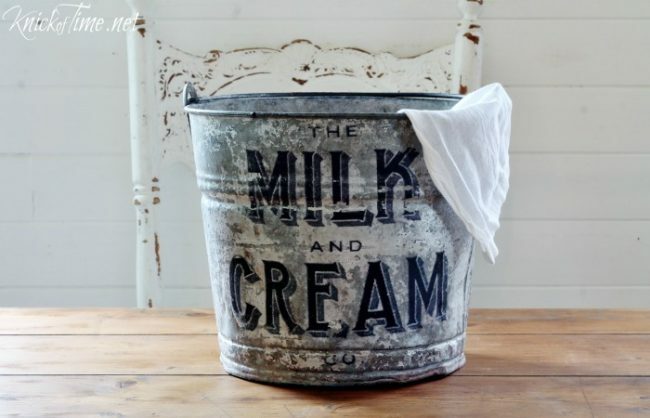 Click on the images below to see more farmhouse stencil projects. Oh Angie! I would have loved to have had this bucket for when I did my art shows with my pottery. 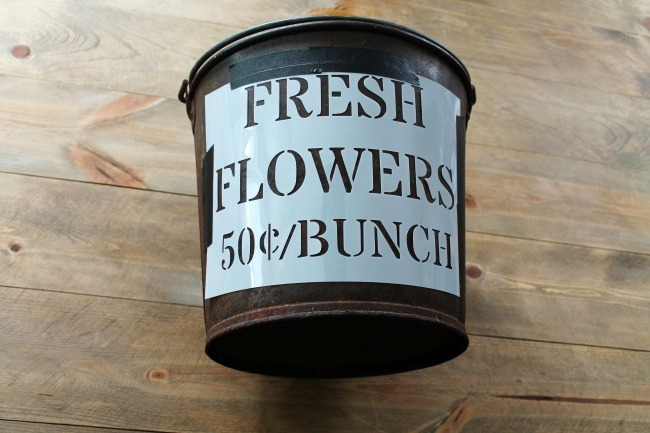 I often would stop at the wholesale florist before a show and pick up whatever was basically in season that was cheap—and use it in the displays and always sold every last bunch, basically for a dollar or two over cost. Often they sold the pot they were displayed in, who can resist a blue country pot filled with daffodils. Grins, and great post, Sandi. 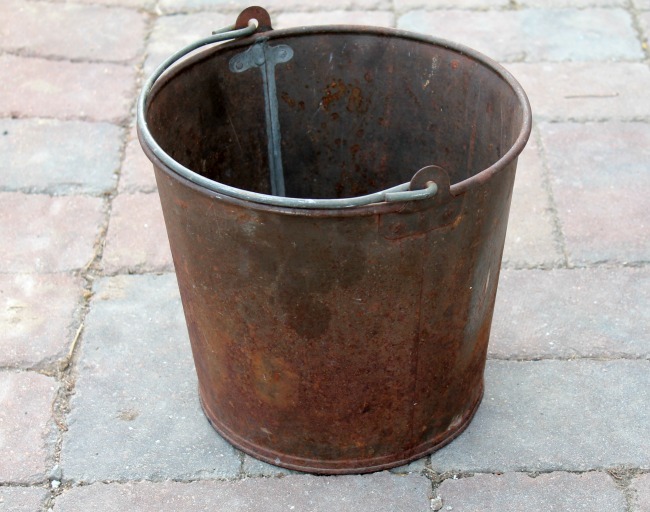 Thanks so much, Sandi – I sure wish I could find more buckets with the same amazing patina this one had. Great bucket, Angie…wonderful patina! The stencil design is perfect with it! Hopefully it won’t be long before you find fresh flowers! Thanks Linda! Since I don’t have any flowers to put in it right now, I decided I’ll use it in my bathroom for a trash can. Thanks Diana! I hope you’re having a great weekend. Angie, that is a great old bucket! I recently bought an old rusty bucket full of old rusty nails! Of course, I didn’t want the nails, just the bucket! But now that I look more closely at the nails I think there might be some vintage ones that I could do something with. Haven’t looked really closely yet. 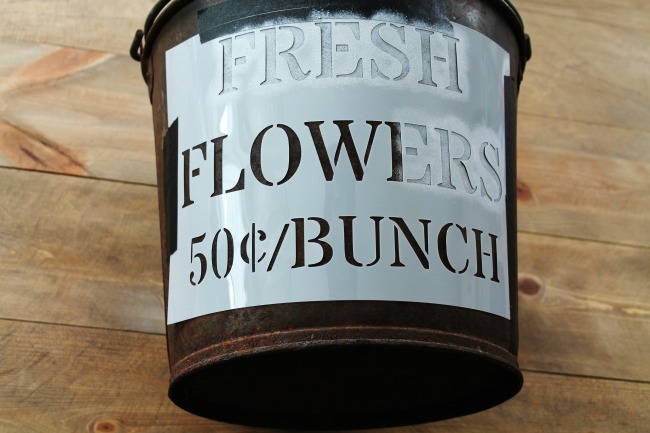 The stencil is just right for that bucket, too! I might have to buy that one for my bucket! 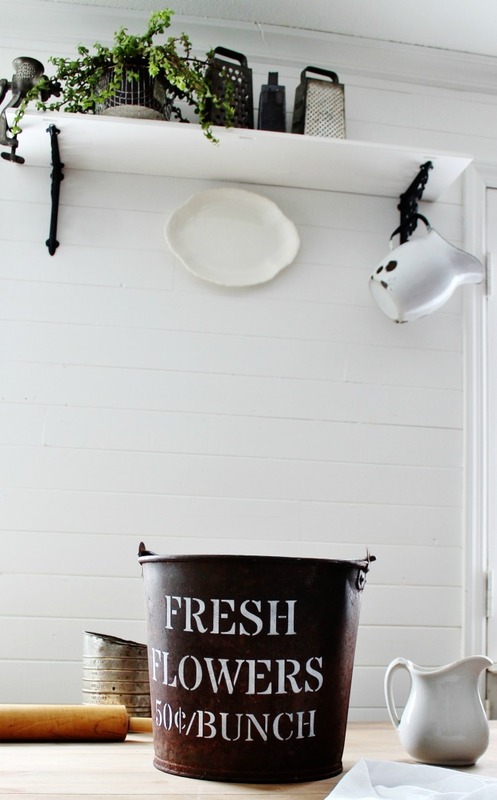 I’m inspired to clean the bucket up now and see what I can do with it. Flowers, maybe, but maybe just pine cones. I know what you mean about those artificially colored flowers. Yuk! I might just wait til Spring when all my daffodils bloom. Wouldn’t they look great in our buckets! Yeah! Love the look! and the rusty bucket, it just perfect. Great paint tip, I agree less is better.